Today we are going to take a look at something you cannot get anymore. Parts and pieces that graced our rides in days past that were noted for some special characteristic, either good or bad, will be featured in this recurring theme from time to time here. I call it "Review Of Parts Past", but that will get shortened to "ROPP", so there! Today's featured part is the Ragley Luxy Bar. This "ROPP" is all about a drop bar that was in production for maybe less than a year. In fact, the rumor is that only one production run was ever made of this bar. I've written reams about the mysterious Ragley Luxy Bar, but maybe I haven't explained exactly why it is that I, and many others, really like this bar. The Luxy Bars as seen on my Gen I Fargo. That is a Bar Yak set up attached to it as well. First of all, the Luxy Bar did two things that previously available drop bars for off road did not do: They had swept extensions and really shallow drop. Here in my image to the left you get a feel for how much sweep the extensions have. This puts your hands, forearms, and upper arms in a very natural position that I find extremely comfortable. Secondly, the extremely shallow drop is unrivaled by any other bar, with the possible exception of the original, (and also unavailable), Gary Bar. Check out the shallowness of the Luxy's drop in the top image. This was important in that the shallower drop requires a less tall stem on many bikes to make it work. Note also in my image of the Badger that the drops end up just a few inches lower than my saddle. Perfectly where I would have straight bars on any "normal" hard tail. Yet, the drop bar has other positions the traditional mountain bike bar cannot begin to offer a rider. Finally, the extensions and the top/ramps of the bar are parallel to each other and the extensions don't point downward at a weird angle, like Woodchippers extensions do. This makes set up far easier and the extensions stay usable. This is the fatal flaw with Woodchippers and it is why I do not like them at all. The Luxy Bar did two other things which I haven't found in any other off road drop bar. One was that despite the extreme sweep and the super shallow drop, the brake/shifter controls don't end up in a super odd position which compromises their functionality or comfort. The levers get laid over a tad, for sure, but there are other bars that had far worse positioning for the controls. The aforementioned Gary Bar being one of the worst in that regard. The width of the Luxy Bar makes for a great drop bar for a single speed. The other thing which no other off road drop bar does, or any road drop bar, to my knowledge, is the 31.8mm diameter of the entire bar top. The Luxy is a fat bar all the way to the ramps, and when you use the tops for an extended climb, or just for cruising, that 31.8mm diameter feels right in the hand. Plus, it doesn't waste space with a taper that robs you of precious real estate for mounting accessories, should you desire to do that. Honestly, it is such a brilliant idea that I am amazed that more companies don't employ the design. The Luxy was not perfect, by any stretch. It was only ever offered in one width, to my knowledge, and that extreme sweep was an acquired taste, for sure. However; it did so many things so "right", I cannot imagine any off road bar that comes close to the Luxy's practicality and comfort. The best bar available today, in my opinion, is Salsa Cycles Cowchipper. It has a really good design, but it has more drop and a tapered top from 31.8mm to the traditional 23.8mm for the control clamp size. The sweep is no where near the same either, so for those looking for a great bar to use on a single speed set up, the Cowchipper is a tough sell. However; the Cowchipper's less extreme sweep is a selling point for many that use geared set ups. The Luxy Bar is, by a country mile, the most innovative off road drop bar since Charlie Cunningham bent Cinelli bars to his taste for his self-branded aluminum mountain bikes in the early 80's. Nothing ever was made like it before or has been since. Apparently, Chain Reaction Cycles UK, the parent company of Ragley Bikes, holds the original tooling and license for the design hostage to this day. Having new Luxy Bars would be a great thing, but don't hold yer breath. I doubt they will ever be produced again. 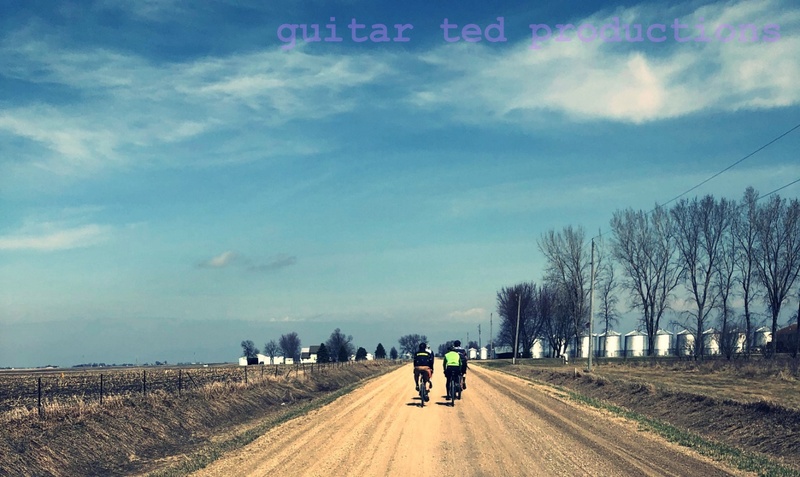 I brought home a bicycle to the Guitar Ted Estate the other day. That isn't necessarily an unusual thing I bring home an old bike or some parts on a fairly regular basis. However; this time the haul was something different for me. A notable experience and it made me reflect on things. The bike itself is nothing remarkable. 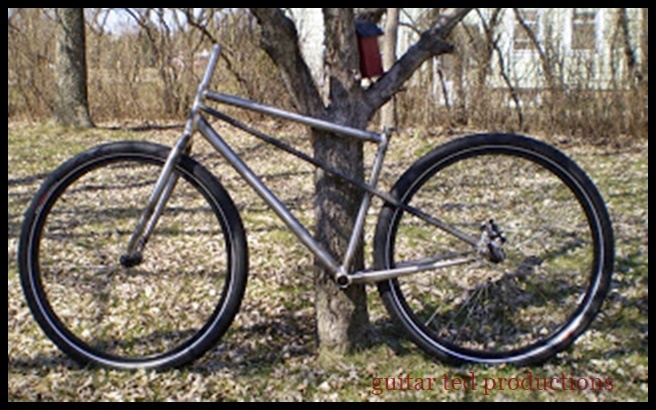 A late 90's Trek, steel frame and fork, middling component group, and some plastic full coverage fenders. Perhaps the most notable thing to the casual observer would be the odd Cane Creek drop add-ons for the handle bars. Not a bicycle many would take a second glance at. It is only notable to me for what it represents to me and the story behind it. In the late 90's my Mom took an interest in bicycling. She had observed my love of cycling over the years and she had just moved to a quiet small village after living in Des Moines. She figured cycling would be a safe choice living in that small community where she had moved. She could get out in to the country easily and without a lot of traffic pestering her. Mom has always been a country girl at her core. Cities never set well with her. She found a close out at the bike shop in the next town over from her and picked it up. Along the way I helped her accessorize the Trek. A computer, clipless pedals and shoes, and yes- those funky drop add-ons. Mom liked those because she could ride into a headwind easier by getting down in those drops. She rode several single days of RAGBRAI with me on that bike, but I imagine it was all those forays out in to the surrounding countryside that were what was most important to her. She used to regale me with the tales of her jaunts out to other small towns via the network of county blacktop roads she used. She spoke of birds, flowers, and how the crops were doing. It was obvious that she really enjoyed riding and being outdoors. Then I remember a few years back how she was telling me how cars and trucks were not giving her space. She didn't feel comfortable riding alone out there anymore. She would keep her rides within the city limits from then on. Eventually the tales of rides ceased, and then last year my step Dad gave me the news that my Mom wasn't going to be riding anymore. The onset of dementia made that too risky of an activity. He suggested that I pick up the bike and find it a new owner. That pick up finally happened this Memorial Day weekend. My Mom is almost 76 years old. I wondered what her last ride was like. Those old tires had absolutely no air in them, and judging by the dust, it had been some time ago. The computer battery was dead. No record of mileage on that bike or the last ride it took my Mom on. Then I thought about "last rides". When would mine be? Someday it will happen for all of us. Cherish every ride you get till then. Thanks to all of our military service members past and present. Especially to those who gave the ultimate sacrifice. Especially thinking about the family of my father in law, Francis odbert, who was a Korean War and Vietnam war veteran who died on Easter this past April. Please take a moment today to remember and honor those who have given service to this country. All done. Now for some tweaking on the set up. Well, the Badger drop bar specific bike is done. Basically, it is what I had intended it to be from the beginning. Well, excepting that I thought I was getting a single speed bike in the beginning, but other than that, this is how I imagined the Badger was to turn out. Most of this build was pretty easy for me to figure out. A 9 speed drive train governed by Gevanelle shifters and an XT/Deore/TA Specialties drive train. of course I used a Luxy Bar for my controls to mount on. The brakes are old Avid mechanical brakes and they are clamping Ashima rotors. The stem and head set are Velo Orange bits while the seat post is a titanium Salsa post. The saddle is a Brooks Cambium C-17 in Wheat. The bar tape is fizik. The wheels were something I figured would be an issue since I have a plan to make the hubs silver as well as the rims. That could have put a big delay on the completion of this project since I wasn't going to accept anything less than a nice quality hub and rim. I also wanted to use a skinwall tire, but to find something that was at least a two inch wide tire with a reasonably fast tread pattern,well, that isn't easy to do yet. So, I decided to go with the wheels I had been using on my Gen I Fargo. Those came over shod with the Teravail Sparwoods and those just needed a new shot of sealant and they were good to go. So , that's the Badger and how it will be for now. I hope to get a new wheeel set going later into the year. On the blog ten years ago this week I was revealing my two "secret project bikes". One I have already spoken of, the Badger drop bar specific bike. 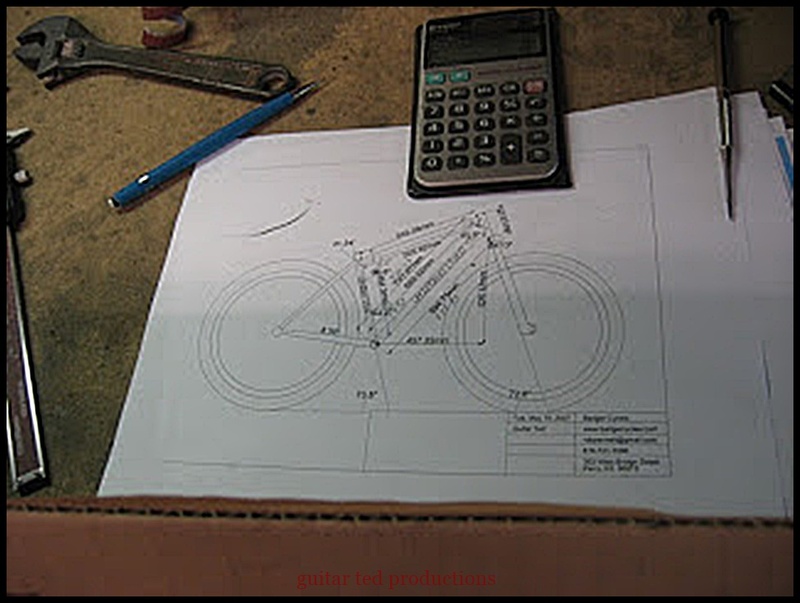 This design, other than the fact that I wanted it to be a single speed, and it came to me as a geared only bike, was something that foreshadowed another bike I would get a year later. That bike was the Salsa Cycles Fargo. Interestingly, there was no other time I can recall when a fat tired, drop bar, 29 inch wheel based bike was so desired by a lot of people. Consider that during this period that not only did I have this Badger brazed up, but that Salsa Cycles heard the customers out there who, like my friend MG, were clamoring for a drop bar 29"er. Consider that at the same time, Singular Cycles' Sam Alison was busy working on the drop bar specific Gryphon 29"er. So, it would be a time that this sort of bike was in the limelight. Not that it isn't to this day. Salsa Cycles longest running model now is the Fargo. Sales of that model are still pretty strong. I don't see it going away any time soon. The other "Secret Project Bike" was my Pofahl. This odd little deal was straight out of my brain. When 29"ers were still a rare thing in the early 00's, I would often draw up frame designs as a way to doodle and pass the time. Yes......I used to have spare time. That was before blogs, Trans Iowa, and reviewing stuff! See, it was dangerous for my mind to be idle. Just think of all the wonky designs I would have come up with had I still been idle all these years! Well, when I met Ben Witt concerning the Badger mtb I reviewed, I mentioned this design to him and he got excited and encouraged me to work with him and Mike Pofahl to make it a reality. Ben took my basic design and then made all the necessary tweaks to that idea to make it an approximation of a "Karate Monkey/single speed specific" 29"er. Ben even designed a swoopy take off of a Jones Bar that he wanted me to put on this bike. It was to be made in titanium. However; things didn't quite go as planned in regard to the bars that were intended for this design. But, as I said, water under the dam. I have the Pofahl as a drop bar bike and that works fine. Trek introduces a 29" wheeled DH sled. Yes......Trek. 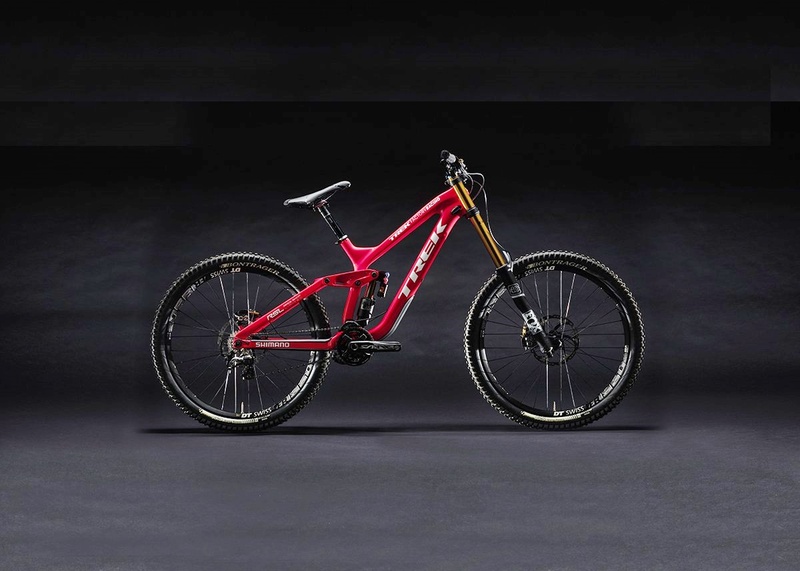 Trek, and by extension, the former Gary Fisher brand, have been on the forefront of 29 inch wheeled developments for close to two decades now. I have to hand it to Trek. They have kept their feet to the fire, (mostly), that entire stretch of time. This production DH sled with big wheels is yet another example of this. While Trek gets poo-pooed often because they are a "big brand", or "corporate" or whatever, you also cannot deny that Trek has put a lot of R&D effort into the 29"er over the years. Have you ever wondered why there are forks with 51mm of offset, frames with shorter rear ends and slacker head angles, and components like Fox Shox and Rock Shox forks for 29"ers? You can thank Trek for all of that. Trek tested ideas in labs and in the field to come up with many of the innovations in 29"ers we take for granted today. So when I hear that Trek tested their Session 27.5"er against the Session with 29"er wheels and found that the big wheels were faster everywhere by up to three seconds per minute, I believe that. When they claim the 27.5"er was not better in any form of their testing, you can believe that they actually did legitimate testing, and those were the results. 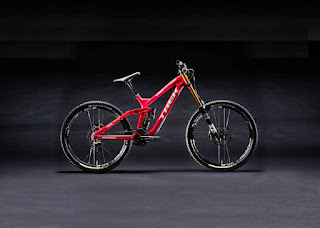 Again, I was a naysayer when it came to 29"ers and DH competition, but kudos to Trek for proving me wrong here. Not that a 29"er DH sled matters at all to me or most folks. But when it does show to what extent 29" wheels make sense across the board for any mountain biking, well, that is significant. Thank you so much to all who purchased t-shirts over the past week. I was floored by the response and I sure hope that these t-shirts bring a smile when they get worn. By the way, if you wear a size medium, you could get one as well. I have about 9 left, and when they are gone, that's it! Interested? Go to the Garage Sale Page for the deets. I'd sure like to see those final sized medium shirts get used up, but if they don't I will likely figure out another plan of action. But thank you again folks! Because I only have 9 shirts to handle now, not three times that many! As far as the money goes, I am thinking I may need to do some sprucing up on the "Truck With No Name", since that is the main recon rig. The tires are getting pretty chewed up on that vehicle, so I am thinking I'll get some new ones soon. And then, who knows.... If there is another TI the truck will be all good to go for it. All I can say is that all the gravel miles have started to take a toll on that truck's shoes. The flowers are back again! I have gotten a couple rides in recently out in the country and the views are really getting good again. The ditch flowers are popping already and the purples, yellows, pinks, and whites flourish in different corners of the county now. So, I have gotten some time on this suspension stem I am testing and more time on the WTB Byway tires also. I will be posting about those things as well as some Banjo Brothers bags I have and a couple of other odd parts I am checking out as well. But the main thing is getting out to see what is going on in the country and also to get some miles in my legs. I'll be honest,this year has been a struggle and yesterday I jacked up some muscles in my left calf taking of a shoe of all things. Mrs.Guitar Ted has been made aware of the problem and has a course of action for me to take. I am not bad, it is just a muscle issue, but it hurts like the dickens. So, yeah, I may be riding more now but I'll be riding slower! At least for a while until this issue clears up. I just hope that I can get out there and enjoy the scenery, ride against the wind, and be gone on my bicycle for several hours. I rode my bicycle yesterday and that was right after I injured my leg. It was fine, but I have to take it easy. The flowers are waiting though! I'll be getting out there, don't you worry about that! That's it for today. Have a great weekend and ride those bicycles! The Wolf Tooth B Rad 2 and Double Bottle Adapters. Wolf Tooth is a company that is perhaps best known for drive train bits and pieces, like those fancy derailleur adapters or ginormous cassette extender cogs. That's all great and stuff, but I never really was too interested in those things. Then they recently announced a new product range dubbed "B Rad". It is a system of bits and pieces that allow a rider to mount things on the bike and get them off the rider's back. Literally. Like water, for instance. Okay, now you've got my attention Mr. Wolf Tooth! I checked this out and found that it may be something worth getting for my gravel bikes. With my "DK My Way" ride coming up, I figured that I would try to graft that gizmo on to my Gen I Fargo. That's my adventure bike and it carries a lot of water as is. The B Rad system is modular and you buy the system parts separately. I chose the B Rad 2 rail and the Double Bottle Adapter since what I wanted to do was add an extra water bottle. Actually, I was also making a difficult to get at bottle easier for me to access and add another bottle. You see, the original Gen I Fargos in size Large, XL, and XXL had two down tube mounted bottle cage options inside the front triangle. I can put two bottles there, one on the seat tube, and one underneath the down tube. That's four bottles plus the two I can mount on the fork blades. With the B Rad parts mounted, I can run seven bottles on the Gen I Fargo. The trouble was that the upper most down tube mounted bottle was really hard to get out and remove. It was possible, but it wasn't ideal. Last year I ran a frame bag and stuck bottles in there. For Gravel Worlds I ran a top tube bag with an extra bottle in there. This year I am maxing out the water carrying capacity for what I anticipate will be a hot, drier Kansas trip. The B Rad gets me the water I need without dealing with a hydration pack. Here is a good look- The rail mounts to the bike and the adapters to the rail. I still need to work on my storage for other items. I have been using the under the down tube bottle as a tool kit. (That's what you see here in the image, by the way.) That leaves six other 20 ounce bottles for water so I figure that if I can plan resupply points at four to five hours ride time I should be okay on water. The new-to-me black Carousel Design Works bag on the top tube will be used for some food carrying duties and I have yet to add my Bike Bag Dude Garage Bag on the top tube which should also be handling food and some personal items. I will likely also use a couple Chaff Bags from Bike Bag Dude as well for easy access food or possibly a wet weather jacket storage. But back to the B Rad..... I have only done a short test ride, but out of the saddle pedaling shouldn't be an issue. I noted that I had the B Rad mounted up the down tube far enough, (due to an interference issue with a cable stop more than anything else), that it places the bottles far enough forward that I have plenty of clearance for my legs. The bottles are easily accessed while riding, as you might imagine, and the extra clearance gained above the lower down tube water bottle will now allow me to use a larger sized water bottle in that position, as well as a large sized bottle on the seat tube. Actually, if I decided against the Chaff Bags, I could use large sized bottles on the B Rad mounted cages. Speaking of wet weather. If I am wrong and the weather looks to be more like the way it was two years ago, I may use a Bar Yak mounted dry bag with spare clothing. But I won't make that call until closer to the event. Late next week I should have a better idea about that, but either way the B Rad set up stays. NOTE- The B Rad bits were bought with my own damn money and I was not asked, paid, or bribed for this post. Since Trans Iowa v13 happened I have seen a few folks reference a concept known as the "Triple Crown". I have a "horse in this race", and I also have the history on this concept, so I figured I would set the record straight publicly before the myth gets out of hand. Grab yer favorite beverage and get ready for the true story. I never have, nor ever will I say that Trans Iowa is a "premier event", a "gravel classic", or "the grandfather of all gravel races". These are things which I have had other people tell me (and more) when they think about Trans Iowa. However; this sort of talk isn't coming from me or any of my Trans Iowa production efforts. Trans Iowa is "Trans Iowa". Period. Nothing more than that. However; since the beginnings of the modern gravel road riding movement, there have been ideas bandied about. One of those was the idea that there could be a "Triple Crown" of gravel events which would help determine the best gravel racer. This idea was first presented to Jeff and I right after we had put on the first Trans Iowa, so probably sometime in 2005. Let's put that in context, shall we? In 2005 there was no Almanzo 100, no Barry-Roubaix, and no Gravel Worlds. We had never heard about Paris-Ancaster, nor about any other long running, big mileage, classic gravel event which may have been going on before we got started. 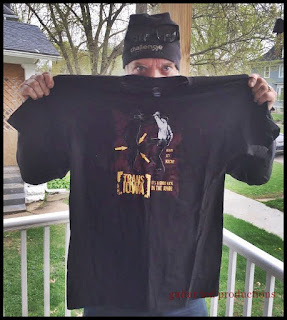 We knew about the Flint Hills Death Ride, (70 miles), and the Colesburg Classic, (40 miles), but there just were no other events like Trans Iowa, and the planned Dirty Kanza 200. The idea that any other events could even be considered for a "triple crown" just was not possible at that time. My shot that I took at the first DK200 of winner Dan Hughes and Doug Long, a volunteer that year. We were in contact with Jim Cummings and Joel Dyke as they made their plans for their gravel event. In fact, it was Jim Cummings that first broached the subject of a possibility of a triple crown with me in an e-mail. There were rumblings of a big mileage event in Nebraska, according to Jim, and if any of that materialized, we should consider a "Gravel Triple Crown". In fact, the mere thought of another event coming on with big mileage actually was an influence on the dates for the DK200 and Trans Iowa. Some time passed and the gravel event which was going to be in Nebraska was a complete mystery to me. With time I had heard about an event planned by Skip Cronin, who was known as the "Endurosnob", which was the moniker of his blog as well. That event was a "one and done" deal, so the gap in the "Triple Crown" was still needing to be filled. That seemed to be possible when I heard about the efforts of the Pirate Cycling League to bring a long gravel event to the table. At the start of the 2015 DK200- The DK200 has become a "big time event" these days. Moving onward through time, the DK200 became a much larger, more polished, and more mainstream event with chip timing, big start and finish line hoopla, podiums, prizes, and now spreads out over four days time to take in. The Good Life Gravel Adventure became the Gravel Worlds, a tongue in cheek take on Pro World Championship racing with a grassroots, down home feel. It has its own "rainbow jersey" for different categories of "Gravel World Champions". It is also a much bigger affair than it used to be. Trans Iowa? Not so much. It hasn't changed much in years. It isn't on the same playing field as these other events these days when it comes to the mainstream idea of an "event". It doesn't have the same cache', nor does it have the same high profile outside of the gravel community that the other two events do. I kind of scoff at the idea that it would even be considered in the same conversation as those two events when it comes to talk of a series of events worthy of a "Triple Crown". But that all didn't matter for years, since the idea was dead, or so I thought. The idea of a "Triple Crown" would not even enter most of our minds again until this year. Dan Hughes had a specific goal coming in to the Trans Iowa v13. He wanted to be known as the winner of the Dirty Kanza (four times), Gravel Worlds, (once), and Trans Iowa. 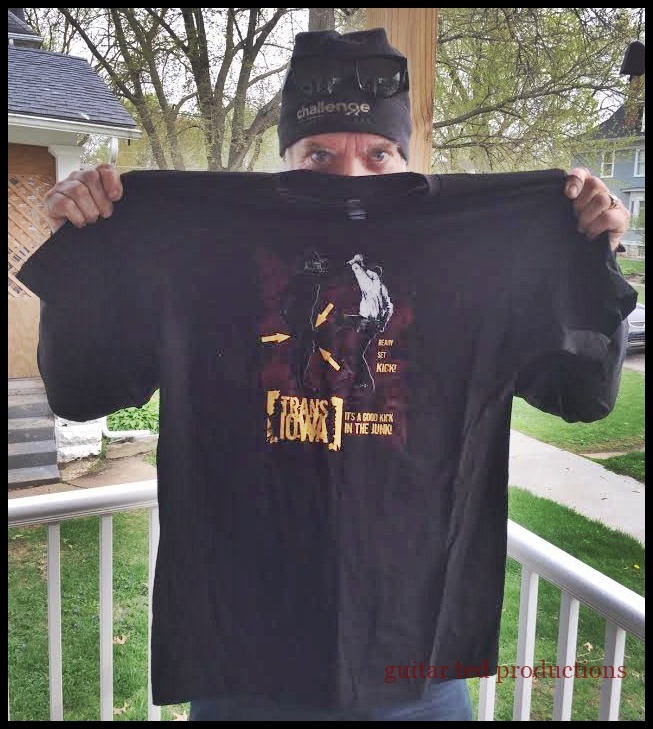 He may or may not have been aware of the whole triple crown thing back in the day, but Dan brought it back when he started talking this goal up post Trans Iowa this year. I was aware of a comment made by Rebecca Rusch concerning Dan's use of the term, but I figured that it was friendly banter that would go away after a while. But it seems that the idea of the "Triple Crown" of gravel is gaining some steam since I have noted that the term is being used by some on social media. That has prompted me to get the story out, and straightened out, before it gets murky and twisted by anyone else who doesn't know what they are talking about. The story above is the true history behind the term in regard to Trans Iowa and is accurate as far as I can remember. *I found a post from 2009 mentioning the "Triple Crown of Gravel" and which corroborates the story here. Click HERE to see that post. Okay, this may be the best example of "an Almanzo rig" that there is.......or not. I saw this rig underneath Andy Tetmeyer of HED Wheels and I was glad to see him park and dismount so I could get an image of this steel rig. It is the antithesis of the Ridley above. Fender mounts and (nearly) full coverage fenders. Steel, lugged crown fork, disc brakes, and what looked to be a decent amount of bottom bracket drop compared to a cyclo cross rig. Of course, those outrageous HED rims were what most folks noticed, but take note of the non-cross approved frame pump under the top tube. Terrene Elwood 40's (Likely measuring over that), top it off. Andy got a top twenty finish on this rig for the Almanzo 100 category. Riders were often too tired or couldn't be arsed to park their rigs proper. This bad image of a fat bike was grabbed on the fly, because I was having my attention drawn elsewhere, but I wanted to get this anyway. It is of the first fat bike we saw Saturday in the event. Note- Steel frame, and drop bars. I thought that warranted inclusion here. Not many folks run fat bikes with drop bars. Perhaps the perfect drive train for a messy Southern Minnesota gravel ride. Finally, I saw this Surly with a Rohloff drive train. The massive torque arm on the non-driveside was the giveaway for me. I thought this was a smart rig for a day like Saturday was. Just look at all that limestone crap! You have to imagine that a lot of drive trains died Saturday in the messy conditions. Perhaps this rig suffered a chain replacement, maybe a bottom bracket issue, but the drive train likely is fine otherwise. A lot less expensive to maintain than some of those fancy exposed drive train set ups are. I'm not 100% sure, but this rig was running a chain tensioner and there might be an inner chain ring there......hmmm. Of course, I did see a smattering of actual "gravel bikes". There were your Warbirds, Vayas, and Tamlands running out there along with some other gravel rigs from other brands. Again, not all the bicycles even made it to Cherry Grove. There was the Stiller tandem, which I heard broke down, and likely a lot of other, super cool bicycles, (and people, obviously), that didn't get to Cherry Grove or who just rode on by like Greg Gleason did on his Cutthroat. So, I am not saying this is a definitive listing at all, but it is what I saw. Thanks again to the Almanzo folks, Penn Cycles, and the Spring Valley Tourism board for letting RidingGravel.com come and be the sponsor of the Cherry Grove stop. We are tentatively scheduled to do it again next year. Let's hope for better weather next time! Jacob waiting in the cold rain and wind for things to get started. Our trip was arranged so that we could ride up and back again with my friend Marty in his Ford Flex. Marty picked us up at 7:00am and we hightailed it up North, raining and blowing all the way. Marty had an intrepid attitude going in to this event and he seemed to be well prepared for the day. He dumped us off in Cherry Grove at about 8:30 am and headed off to find his starting spot in the event. We were left in the forlorn looking town made even more dreary by the cold, wind driven rain which was slashing down and drowning everything in a heat sucking, watery curse. Only the robins seemed pleased as they hopped about, joyfully chirping as they pulled doomed earthworms out of the water-logged ground. Whomever showed up for this Almanzo was in for a brutal day, that was for sure. Jacob and I shivered and milled about as best we could, trying to stay warm and engaged with each other. Actually, with the sub-40 degree temperatures, the wet air, and the strong winds, I was already going in to the throes of hypothermia after only being there about an hour. My chest ached and I tried to do some exercises to get the blood pumping again. Fortunately, after a little over an hour, Ben and Matt showed up with all the supplies and we set about to getting the checkpoint operable. Ben scored the use of this fire pit from the local Spring Valley hardware store owner. It was much appreciated! We set about to getting some shelter up first of all. It was a pop up tent given to Ben to use by Surly Brewing. The work was welcomed by Jacob and I and it helped to warm me right up. I think had I had to stand out there much longer I might have been in trouble. The work went fast with many hands. We were joined in our efforts by Troy from the USECF Gravel Nationals (If you haven't heard of Gravel Nationals, I recommend listening to this podcast) Matt and Ben also helped a lot to get the checkpoint looking like something within a short period of time. Matt kicked right in to frying bacon and my son assisted him in that task. Meanwhile, Ben and I got a fire going in a borrowed fire pit that Ben had secured from the local hardware store owner in Spring Valley. Not long afterward, the man from Cherry Grove in charge of taking care of the community center stopped by and opened up the place which had heat and a clean, dry place to sit. Now we were ready for the first riders. The first seven riders trickled through within an hour or so of each other and then it took a long time before we saw anyone else. Suddenly a call went up that there was a rider spotted. He was all alone and looked a little unhappy, but who wouldn't be in those conditions? Anyway, it was quite a few minutes before we saw another pair, then quite a few minutes more before we saw another lone rider. Finally, we had about seven go through within about an hour or so of each other, then nothing for a long time. Meanwhile we went in to the community center, which was a country school from the 1880's to 1954, and warmed up by the gas furnace. We "cooked" our wet clothes on top, just like we used to do back when I was a kid at many of my relative's country homes when we would get wet playing in the snow as kids. (L-R) Sam Cohen, Troy from Gravel Nationals, and Ben Welnak gathered under the tarp behind the RadTour's Sprinter van. We noted a Sprinter van which pulled up, set out a big, blue tarp, and had a dog cavorting about. It was Audrey Wiedemier and Sam Cohen who were helping support some folks, I believe, on the Almanzo. Anyway, Audrey has a touring business going where she takes folks on short, mixed gravel and pavement routes to farms where the idea is to get local produce and meats to eat. I probably have some of that wrong, but maybe someone could comment on this post and set me straight? Anyway, Audrey and Sam had tea and were very gracious to anyone who ducked under their blue tarp for shelter. And we needed all the shelter we could get. It blew hard and rained a lot most of the day. Riders that stopped by at the checkpoint were treated to a warm fire and lots of attention from the bystanders. Jason O'Mahoney of Gravel Cyclist avails himself of the hospitality at the RidingGravel.com food table. We were told by Pat Sorensen of Penn Cycles that "everybody is dropping out..." and while we didn't know exactly what that meant, we had only seen about 15 cyclists by 3:00pm! However; a slug of bikers were spotted, and then a slow trickle of wet, weary cyclists were coming by in ones and twos until probably around 5:30 or so. By that time we were seeing a few of the Royal 162 riders, of which there were only seven or so left of that started the event. One of them, the leader, Greg Gleason, went steaming by on his distinctive Salsa Cycles Cutthroat. He looked really strong. I was told by Joel Raygor that Ben Mullin, who was in Trans Iowa v13 this year, had a "special gift" which he was carrying for me and that I should wait for him to reach Cherry Grove. By this point, Marty, who had abandoned in Preston, was there waiting with our ride back to Waterloo. It was a great thing that Marty was so amenable to the idea of waiting around a bit longer. Thanks Marty!! In fact, Marty ended up giving a local to us rider a hitch back to the starting line. So, it all worked out. Ben eventually rolled in with a few other riders and proceeded to dislodge six cans of craft beer which he had hauled around the Royal course to give to me along with a movie pass for my wife. What a guy! Don't try this at home kids, because hauling around all that extra weight in those conditions was a handicap Ben didn't need. That was super awesome of him to do and I won't soon forget about that. Well, a few more riders came around after that, but according to the report we had from Joel Raygor, the last of the riders were to arrive very soon. I have no hard numbers on how many folks went by us. I lost track at 25-30, but I would be very surprised if more than 75 riders passed us at Cherry Grove. (NOTE: Initial Almanzo tabulations show 110. I find that hard to fathom myself.) It was a very difficult day, and many made a wiser decision for themselves and pulled out after shorter rides, or decided not to come at all. Ben Welnak, who was at the start, said maybe 300 folks were in Spring Valley to start the event Saturday. So, obviously this unseasonably cold, wet, windy weather has had a big effect upon the turnout and the finishing numbers. Martin took us home and we arrived shortly before sunset. Probably about a ten hour day of exposure for myself and my son, but we had a blast and we hope that our "gravel family" had a good time despite the conditions. I look forward to seeing many of you again and more at the Dirty Kanza 200 in a couple of weeks from now. Hopefully the nasty weather will leave us alone! Thank You: To Ben Welnak and Matt McCauley of RidingGravel.com, to Troy of the USECF Gravel Worlds, Penn Cycles, The Spring Valley Tourism Board, The Cherry Grove Community Center, Surly Brewing Company, and especially to all of the outstanding Almanzo riders. Thanks to all that came to hang out with us at the checkpoint. It was wonderful to have been with you all. #gravelfamily Finally- A big Thank You to Martin Bunge for the transportation and great conversation. 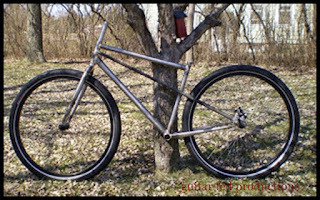 Ten years ago on the blog this week I was yakking about one of my "Special Projects" which I had done back then by two different custom frame and fork builders. Yes- I had two custom bikes made at the same time. I've never had any done before then or since. This was a Badger. 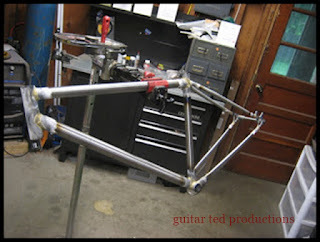 Now, if you know anything about that brand, there was a lot of bad blood related to this builder starting right around the time I had this frame done up. I won't get in to all of that, and I am not at all interested in dredging up old hurts and hang ups any of you may have concerning Badger frames or the guy that made them. It was what it was, and it is over now. But when this was being planned, all was on the up and up, at least as far as I knew. Originally, this frame was supposed to be a single speed, but then things went on, and on, and on..... I had heard a few rumblings of bad news surrounding the builder, and I had no updates for several weeks. I was worried, I'll admit. Then I got a call from the builder. "This was suposed to be a geared frame, right?". Then there was my last ride with "Mr 24". That happened at the Boy Scout Camp. or "Camp Ingawanis". The North side, of course, because that is where we rode back then. I was on my old black geared Raleigh XXIX+G. I remember my BB-5 brakes came out of adjustment and I about ate it on a fast down hill corner. Anyway, I never have ridden with Jeff Kerkove since then, and if I am not mistaken, it was one of the last times he was around the area to ride.I guess I didn't really know it, but it was his way of saying "goodbye", perhaps. That weekend ten years ago was the Dirty Kanza 200. I was supposed to go, but I ended up playing at a friend's outdoor wedding. I couldn't get out of that gig. I remember thinking the whole time at the wedding that I'd rather be in Kansas that weekend, and I still do. Oh well. I believe that was the earliest the DK200 was ever run also. It would have been good, but that was not in my cards. Limited supply. Help me clear out my house of these! If you were thinking that the TIv13 t-shirt was cool, you aren't alone. They were a big hit at the event this year. Unfortunately, I was stiffed by several late droppers from the event that asked to have a t-shirt reserved for themselves. Now, I am stuck with a pile of t-shirts that are (mostly) not my size, so I cannot use them. Maybe you could? I'm not going to lay it all out here, go to that Garage Sale Page and read it. The info is all there. I'm just going to ask you to help me free up some space here and to help me get these on people's backs so they are getting put to good use. The price is right, (basically cost plus shipping), so you cannot go wrong here for a limited run design in three colors on a quality cotton t-shirt. Shirts will be sent out in cardboard boxes and I may throw in a couple stickers there as well.UPDATE: Thanks for the awesome response so far! I am out of size Small and XL now. Plenty of Mediums, and 4 XXL's as of 7:00am. My son and I will be spending tomorrow up at Cherry Grove, Minnesota to help support the Almanzo 100 with RidingGravel.com. We should be dodging rain drops, by the sounds of it, so there maybe will not be the throngs of riders that we saw last year. Hard to say. It's been my experience that when you have a free to enter event with a bad weather forecast it tends to put a damper on turn out. But regardless, we will have fun. I'm not sure exactly what Ben has planned, he just wants me to show up and I'm sure he will have everything in order. 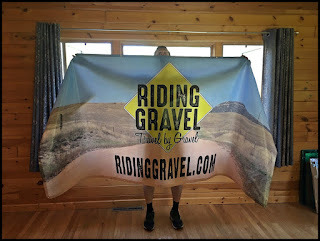 I do know we have a RidingGravel.com banner, the signs from last year, and we will be in a Surly Brewing pop up tent. Same location as shown here in the image, so it shouldn't be too tough to find us. You should be going right by us on the road and we will be on your left side, if you are planning on riding this event. And if you are riding, and worried about the weather, well, just go and ride. Any day out riding is better than not riding. Have fun, and enjoy the gravelly good times. I hope to see some of you up there, and if you are riding, or just hanging out, please stop by and say hello. I'll have a report on Monday, so stay tuned. After the Almanzo support weekend I will be dialing in my rig that I will be taking to Kansas to ride the Flint Hills with. As of now I have no reason not to be doing that ride on anything but my Gen I Fargo, but that could change in a couple of weeks! I have a route plan in mind, and I probably will be doing a similar ride as I did last year when I was down there. I'll have to start checking the weather and looking at maps here so I have a better idea of where I will be going before I get down there. That said, I wouldn't mind seeing some of the same stuff I saw last year again. It was good and I am sure I will have to include at least a few things from last year's ride. Well, depending on the wind! I should probably plan an alternative route just in case of contrary winds. Okay, that's a wrap. Try to get out and ride, and if you are doing the Almanzo, good luck! That's Ben displaying the new RidingGravel.com banner we will have up at Cherry Grove. Last year through a series of bizarre circumstances I ended up in Cherry Grove, Minnesota on a chilly, super windy day, cheering on riders in the annual Almanzo 100 and Royal 165 events. I took my son with me, and he had a blast. It was a great day, albeit totally unexpected on my end. Now it is 2017 and RidingGravel.com is committed to supporting the Cherry Grove checkpoint for the Almanzo 100 again. Last year we had minimal "presence" in terms of our name being out there, so if you didn't catch that it was Riding Gravel doing that checkpoint, I totally understand. It was a last minute effort which we were not 100% prepared for, but in terms of what counted to the riders, we did a good job by all accounts. So, this year we have a banner, and we have those two road signs we had last year, so look for us if you are in the event. We will try to have a good time, provide drinks and snacks like last year, and generally be supportive of the efforts of you, the riders. Stop by and say "hi", if you'd like, or ride by and give us a wave and a smile, if you care to. We look forward to seeing you, if you are going.